Reading is one of the foundations of overall literacy and helps inspire a love of lifelong learning. The Library has a number of resources to support struggling readers, and in 2017, redesigned one of its popular programs. 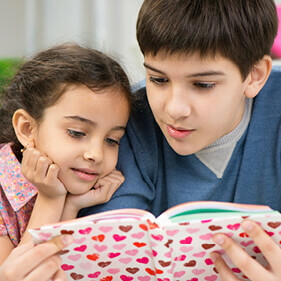 ConocoPhillips Reading Buddies pairs youth volunteers with struggling readers in Grades 1 through 3 to share books and play literacy games in a group setting. The six-week session sparks an interest in reading for the “little buddy” while providing opportunities for youth volunteers to develop mentoring and leadership skills. Thank you, ConocoPhillips for helping to build a strong future for Calgary’s children through your generous support of the Calgary Public Library!